Queen Oatmeal Recycled Paper Bags 200 Pk 16x6x19"
Queen size Oatmeal Kraft Paper Shopping Bags by the carton. 65# paper weight. Made from 50% recycled paper with 10% Post Consumer Recycled content. Green Way® Eco-Friendly Packaging. Made in the USA! 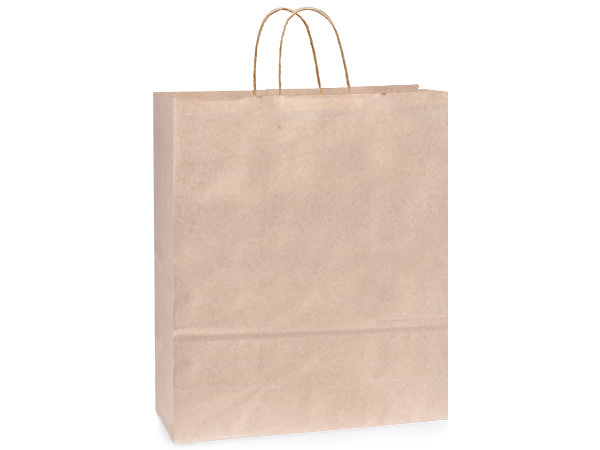 These oatmeal colored shopping bags have a matte kraft finish and matching handles. These bags are 50% recycled, including 10% post-consumer recycled material. Easily complete your look with our solid color tissue paper! All of our paper shopping bags are proudly Made in the USA!